New Solid Stainless Steel Weber Genesis Cooking Grates. Free Shipping. Replace Weber Summit BBQ Burners And Cross Over Assembly. Before the last big group of changes to Weber models the Summit barbecues were classified into Silver, Gold and Platinum to distinguish the colors and material used in fabrication. The Silver, Gold, or Platinum were further divided into a number Four or Six which referred to the primary barbecue burners and then further named with A-B-C-D to distinguish whether the barbecue grills had a rotisserie or a smoker assembly or a side burner range top. From that era of Weber American made Summit barbecues these are the replacement 3 section burner replacement kits. Three sections of Weber Summit Burners all ship together to replace the assembly of burners in these models. The straight pipe burners are machined with carburetor adjustments at the venturi where the controls slide into the burner and opposite back tabs ensure the left burner installs left and the right burner installs right. Cross Over Tubes facilitate faster ignition by allowing flames to jump across from one burner pipe to another by following the flow of gas. The cross over acts like a small third burner and is ported for flames like a burner. Also the two main Weber pipe burners have holes for the cross over installation and the burners have perpindicular flame ports added to the burner. The extra ports crossing the pipe burner ensure ignition across the small cross-over burner. All Weber barbecue grill burners have this same spider screen wire mesh designed to keep small insects out of the burners. This is more marketing than pragmatic as insects small enough to impede an orifice will get into the burner and valve if they can. The sleeves adjust to mix air and gas for efficient burner heat. Note crossed ports are on left burner where we mount the electrode. 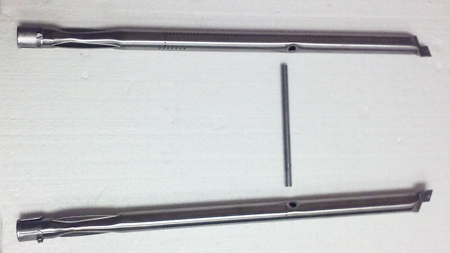 Stainless steel burners and cross over burner for Weber Summit Silver B gas barbeque grill models. 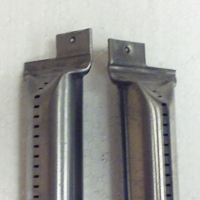 Two Stainless steel burners are 20 5/8 Inches long and 6 Inch cross over burner fits into burner. Weber Summit Gold and Platinum A, B, C, D Models and fits S-650 and S-670 earlier versions. Check specification. B gas barbeque grill models. 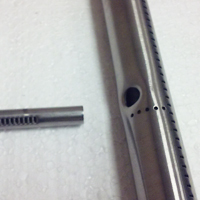 Summit Burners have opposing clips in back where the burners slide into tabs that hold the burners level. All barbecue burners have to have a way to hold the burner level because gas will gravitate to the lower area and burn inconsistently. Weber burners have opposite installation clips to ensure the left burner is installed to the left of the right burner. Stainless Steel Weber Summit Burners have extra cross-over ports on the right and left side of both burners where the cross over tube burner is installed. The burners create extra flames at these crossed flame ports in order to make sure there is flame to jump across from the ignition at the left and burn gas emitting from the right side burner. We shot this image of the Weber Summit Burners side by Side in order to show left burner is different from the right side burner. The cross over ports are on the left side only in the front part of the Weber Summit burner assembly because this is where the single electrode and collector box sparks to ignite all three burners. Towards the back where the cross over burner installs across the two pipe burners both right and left burners have cross-over ports in order to facilitate faster ignition crossing to the right side burner.